When Robert Young and Jane Wyatt began their successful run as Jim and Margaret Anderson on TV's Father Knows Best in 1954, they came to the show with many years of acting experience in motion pictures. Specifically, Young's movie career dated back to 1931, when he turned up in an early Charlie Chan picture; and Wyatt's debut in Hollywood traced back to 1934. By the early 50s, however, both their movie careers were in decline. 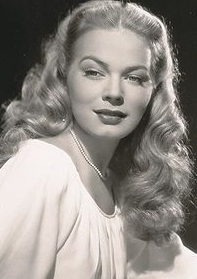 In fact, with fewer movie roles on the horizon, Young had started appearing in the radio version of FKB during the summer of 1949. Two other actresses played his wife on radio, but when the production transferred to television five years later, Wyatt was brought on board. It was a runaway hit with audiences for the next six seasons, and over 200 episodes were made. Young never went back to feature films, turning instead to other television series and a few telefilms. But Wyatt did reappear on the big screen. In the 1970s, she was seen in Disney's TREASURE OF MATECUMBE, and in the 1980s, she was Spock's mother in STAR TREK IV, a role she had previously played on the television version of the classic science fiction series. Jane Wyatt and Robert Young present and accounted for...! Saturday November 21st: two comics who worked for Hal Roach and turned the 1930s upside down. 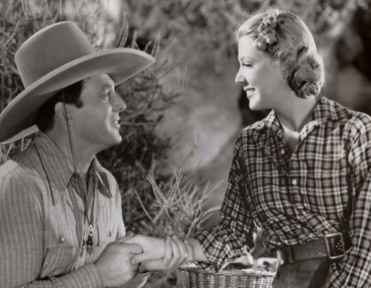 Sunday November 22nd: a silent movie star turned western cowboy, and his most frequent leading lady at RKO. Monday November 23rd: one of Paramount's rising stars in the late 40s, he worked with sisters Olivia de Havilland and Joan Fontaine (on separate pictures). Tuesday November 24th: this Argentinian-born beauty was discovered by producer Hal Wallis and went on to make her mark in noir and westerns. 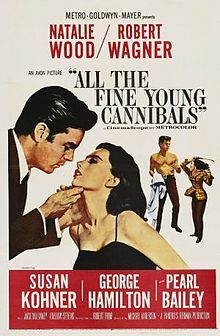 Wednesday November 25th: a leading man of the late 1950s and early 1960s who would become more well-known as a novelist. Thursday November 26th: one of John Ford's favorite character actresses; she starred in a hit film for the director at Fox in the 30s. 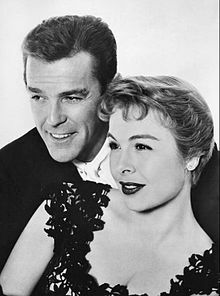 Friday November 27th: a British couple who found success in England in the late 40s before coming to Hollywood and achieving even greater fame. Stan Laurel and Oliver Hardy made over 100 films together (including features, shorts and cameo appearances). 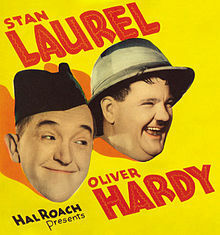 Laurel started in the film business in 1917, and Hardy had begun in 1914. They were first united on screen in 1921, but they didn't really become a team until 1926. From that point forward, they worked almost exclusively as a comedy duo, though there were a few times when they worked separately. The 1930s were the years when they achieved their greatest fame under contract to producer Hal Roach. Hits and leading ladies during this decade included BEAU HUNKS, a short film with Jean Harlow; THE DEVIL'S BROTHER, a feature with Thelma Todd; and THE FLYING DEUCES, another feature, this time with Jean Parker. The boys would see their popularity decline in the 1940s but continued their side-splitting act and still made occasional films into the 1950s. And though he lived until 1965, Laurel officially retired in 1957 after the death of Hardy. 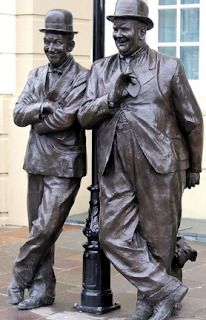 Stan Laurel & Oliver Hardy present and accounted for...! 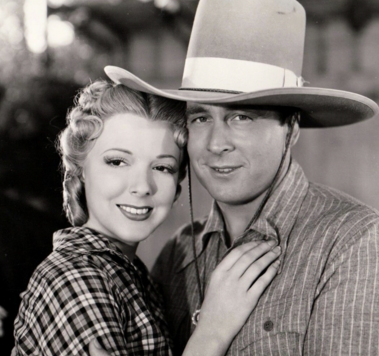 George O'Brien and Virginia Vale made a handful of westerns together at RKO in the late 1930s and early 1940s. O'Brien had been a leading man in silent films, most notably in Murnau's SUNRISE with Janet Gaynor...but with his good looks and pleasant voice, he easily transitioned when talkies took over. Within a few years he had comfortably settled into playing leads in B westerns, and he made many of them before retiring. Virginia Vale was one of RKO's starlets who had won a contract through a special contest. Initially, RKO bosses put her in serious dramas, but they quickly realized her wholesomeness was best suited to westerns. 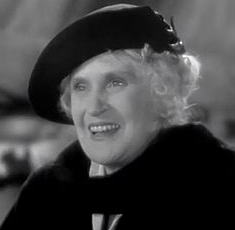 She and O'Brien costarred in six of these pictures. 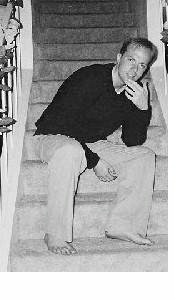 When O'Brien left the studio, Vale was then paired with his successor, Tim Holt. Virginia Vale & George O'Brien present and accounted for...! John Lund became a leading man in Hollywood when he signed on with Paramount in the mid-1940s. Perhaps due to his striking Norwegian-American looks (more than his abilities as an actor), the studio assigned him to pictures with its top directors and leading ladies. He acted opposite Olivia de Havilland in Mitchell Leisen's TO EACH HIS OWN, and opposite her sister Joan Fontaine in DARLING HOW COULD YOU!, again for Leisen. 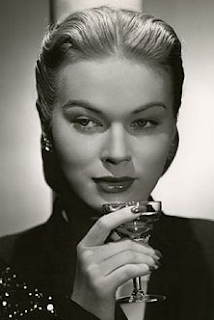 Other costars at Paramount included Betty Hutton, Gene Tierney, Marlene Dietrich and Paulette Goddard. 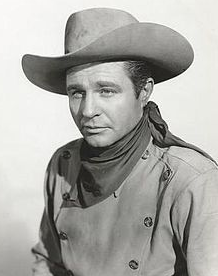 In the 1950s, he appeared in musicals as a non-singing second lead and drifted into westerns, as many leading men did. His last significant screen role was in 1962, before he left the movies for a successful career in business. He was one of those rare stars from the golden age of Hollywood who never took any acting roles in television. John Lund present and accounted for...! Kristine Miller lived an interesting life, more than most actresses do. She was born in Argentina and raised for a time in South America before living in northern Europe (her father was a Danish oil executive). Then it was off to San Francisco for her teen years (her mother was an opera singer there). At 18, she went to Hollywood for her first screen test...she and Lizabeth Scott would soon be producer Hal Wallis' two new discoveries at Paramount. While Lizabeth usually had the flashier lead role, Kristine would play the more elegant and chic second lead. And it didn't matter if Lizabeth might have chewed the scenery, because it's Kristine's mysterious and glamorous aura that captures the viewer's attention. 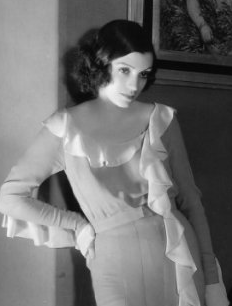 Wallis made sure Kristine had leads in loan outs to other studios who used her for B films. After her contract with Paramount ended in 1950, the actress made a home for herself at Republic, where she became good friends with Joan Leslie. Republic's westerns were the perfect fit for Kristine who brought her stately, refined grace to rural dramas. She eventually transitioned to television in one of Republic's first weekly western series with Jim Davis. In the early 60s Kristine left Hollywood, when she and her husband started a handful of TV stations in northern California and Idaho. And not all were in English, since Kristine spoke at least five different languages and was instrumental in bridging cultures as well as continuing to promote the arts. Kristine Miller present and accounted for...! Though he became known later on as a well-regarded author of horror and science fiction stories, there was a time when Tom Tryon was on the fast track to stardom as a Hollywood leading man. 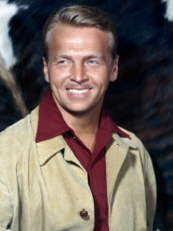 He first turned up on television programs in the mid-1950s, and it did not take long for him to sign with Paramount. The studio put him in a western with Charlton Heston and Anne Baxter called THREE VIOLENT PEOPLE and gave him the lead in the cult classic I MARRIED A MONSTER FROM OUTER SPACE. During the next decade, he would work twice with director Otto Preminger, in one of those productions as the title character in THE CARDINAL. 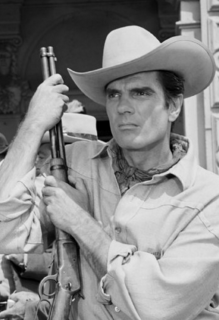 He continued to take roles on western television programs and did the remake of WINCHESTER '73 in 1967 for Universal, which aired as a TV-movie. By the end of the sixties, he gave up acting to focus on writing. His career as a screenwriter and novelist continued until his death in the 1990s. 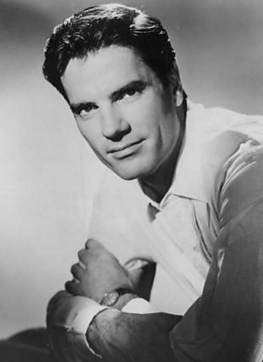 Tom Tryon present and accounted for...! 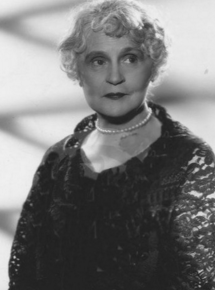 Though she was already established as a leading stage actress going back to 1900, Henrietta Crosman was mostly 'new' to film audiences when she turned up in a talkie called THE ROYAL FAMILY OF BROADWAY in 1930. However, she was no stranger to films, since she had done a few silent pictures in her younger days. But now in her seventies, she experienced a career resurgence in movies and quickly became regarded as one of the industry's most versatile character actresses. She had a starring role in John Ford's drama PILGRIMAGE, about a rural mother who visits the battlefields of Europe where her soldier son had been killed. And she also played high society types, such as in Sam Goldwyn's drama THE DARK ANGEL as Merle Oberon's grandmother; and in PERSONAL PROPERTY, an MGM romantic comedy with Jean Harlow. Miss Crosman was retired from show business in the early 1940s, but in the final years of her life was still recognized for her sharp characterizations on stage and screen. Henrietta Crosman present and accounted for..! 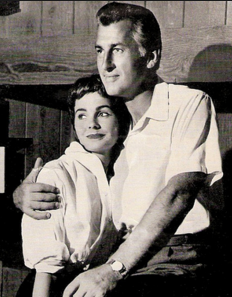 The early days of Jean Simmons & Stewart Granger included their costarring in the hit romantic comedy ADAM & EVELYNE in 1949. Both had already made a name for themselves on stage and screen. In fact, by age twenty, Jean had become a household name with her exquisite performances in GREAT EXPECTATIONS and HAMLET (where she played Ophelia and was nominated for an Oscar). Other hits followed and so did Hollywood stardom when her bosses at the Rank Organisation sold her contract to RKO. In late 1950, the couple wed in Arizona-- Stewart had also gone to Hollywood, having signed with MGM. He enjoyed great success with remakes of KING SOLOMON'S MINES and SCARAMOUCHE, and they soon reunited on screen at MGM for the lavish period drama YOUNG BESS. A few years later, they appeared in Columbia's thriller FOOTSTEPS IN THE FOG, filmed in their native England. They had one daughter and divorced in 1960, but remained lifelong friends. 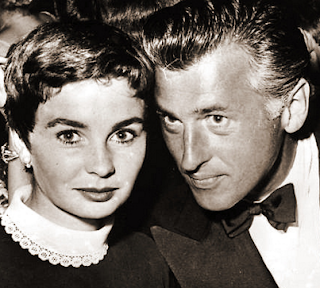 Jean Simmons & Stewart Granger present and accounted for...! Saturday November 28th: Two popular character actors at Warners in the 1930s, often paired in the studio's B pictures. Sunday November 29th: A husband-and-wife dance team who appeared in several MGM Technicolor musicals. Monday November 30th: A Paramount actress in the 30s who costarred with Bing Crosby and the Marx Brothers. Tuesday December 1st: An actor who started out in a Bette Davis melodrama but found success in westerns...and even more fame later on as J.R. Ewing's daddy. 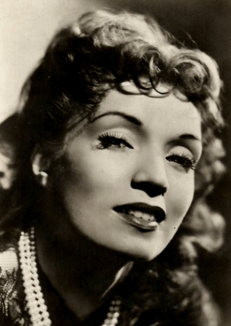 Wednesday December 2nd: An actress from Spain who made English and Spanish language films in Hollywood during the 1930s. Thursday December 3rd: Make room for Danny. Friday December 4th: A Hollywood couple that made one feature film together and were married to each other twice. 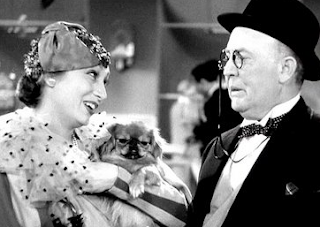 Aline MacMahon & Guy Kibbee were two of Warner Brothers' most dependable character actors in the 1930s. They did so well together in GOLD DIGGERS OF 1933 that the studio decided to pair them more often. Sometimes they were assigned domestic comedies like BIG HEARTED HERBERT, where Kibbee is a blustery corporate type and MacMahon is the wife who keeps the household going. Or they were given B mysteries like WHILE THE PATIENT SLEPT, where MacMahon was a nurse and Kibbee was a detective trying to solve a murder. No matter what the story might be, audiences looked forward to seeing these two pros on screen. The duo appeared in nine films at Warners in the 1930s, and another one at MGM in the early 1940s. 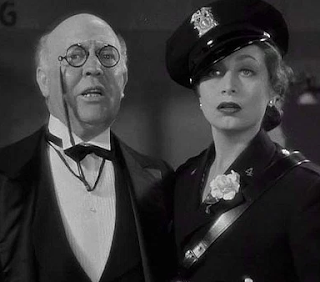 Guy Kibbee & Aline MacMahon present and accounted for...! 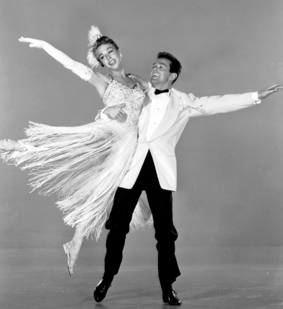 Marge & Gower Champion were MGM's answer to Ginger Rogers and Fred Astaire in the 1950s. The plan was to remake most of the old Rogers-Astaire musicals with MGM's typical polish and Technicolor production values, thereby catapulting the dancing couple to great fame. But the husband-and-wife team only ended up remaking one of those earlier films, ROBERTA (which became LOVELY TO LOOK AT), and they were in support to other stars. However, MGM did give them their own starring vehicle, GIVE A GIRL A BREAK, in 1953. But soon movie musicals were no longer in vogue, and the two performers moved on to television and various live performances. In later years, Marge turned her talents to religious-based dance, and Gower had a string of hits on Broadway as a choreographer-director. Gower & Marge Champion present and accounted for...! 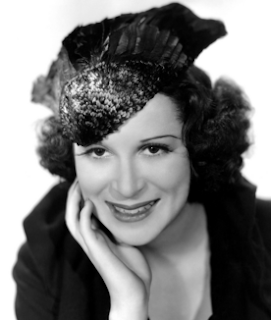 Kitty Carlisle lived a long life (she was 96 when she passed away in 2007) and it was a life filled with adventures. When she was in her late teens, her mother was carting her around Europe in the hopes of marrying her off to a prince. When that didn't work out, her mother brought her to New York and finagled singing and dancing lessons with the top teachers and pushed Kitty on stage, where she usually performed operas and light musical comedies. After some success on Broadway, her mother had their bags packed and they were off to conquer the next thing-- Hollywood. 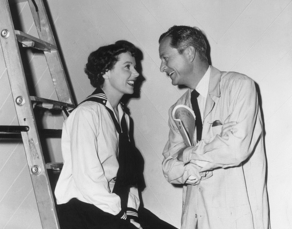 Within two years, she was doing leads at Paramount with Bing Crosby. She made two films with the popular crooner. And a year after that, she was appearing opposite the Marx Brothers at MGM in A NIGHT AT THE OPERA. Her participation in the movies tapered off, but she experienced a resurgence in the 1950s as a panelist on hit TV game shows, something she did full-time for the next 25 years. There were occasional returns to the stage, and in later years she had small parts in film again. She was also known as a crusader for the arts, and if anyone could get around and gather support for her favorite causes, it was this social butterfly. Kitty Carlisle present and accounted for...! 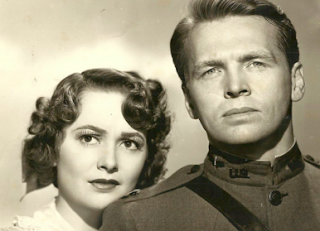 Jim Davis had his first significant film role, billed as James Davis, in the Bette Davis melodrama WINTER MEETING. The film was not a hit with audiences, but the actor had already made fans in the industry. He sufficiently impressed Herbert Yates, owner of Republic Studios, who signed him to a contract to make westerns. During the late 1940s and 1950s, Jim Davis was probably the most versatile performer at Republic, effortlessly playing opposite the studio's leading ladies and holding his own with the other leading men, especially when he was selected for villainous second leads. 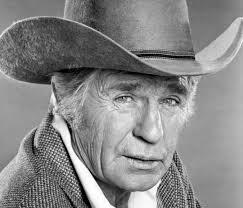 In the late 50s and 60s, he was starring in independently produced westerns and war films that were tailored around his particular talents and he was showing up with great frequency on television. Of course, TV would bring him his greatest notoriety as an actor in the late 70s and early 80s. Before his death in 1981, he had made his mark as Jock Ewing on the hit series Dallas. In later seasons, his portrait adorned the wall of the show's office set. It wasn't so much a symbol of the character he had portrayed, but instead the portrait of a fine actor. Jim Davis present and accounted for..! Conchita Montenegro was a dancer from Spain who found success acting in Hollywood films during the 1930s. In addition to her sultry looks, she was often cast because she was able to perform both the English and Spanish language versions of films for the studios that employed her. Leading men included Leslie Howard in NEVER THE TWAIN SHALL MEET, which led to a romantic relationship and a friendship that would endure until Howard's death. She also costarred opposite Warner Baxter in the first CISCO KID movie Fox produced; and she worked with George O'Brien and Victor McLaglen. By the mid-1940s she was back in her native Spain appearing in that country's version of LOLA MONTES as the title character. Involvement in motion pictures soon ended as this was her last film. She continued to live in Spain and remained in the public eye as one of her generation's more notable socialites. Conchita Montenegro present and accounted for..! 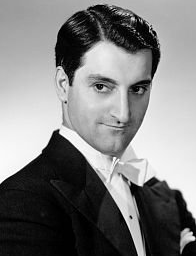 Danny Thomas began his entertainment career as a nightclub performer in 1932 when he was only 20 years old. He would spend the next ten years paying dues in clubs around the midwest and on radio. He joined Don Ameche's national radio show in the early 40s, and within a few years had his own series as well as his first role in a film, MGM's UNFINISHED DANCE with Margaret O'Brien. Another MGM picture with O'Brien followed, as well as roles in musicals with Betty Grable and Doris Day. He also starred in the early 50s remake of THE JAZZ SINGER. But he then transitioned to television where he found his greatest success. For over a decade he played Danny Williams on the hit sitcom Make Room for Daddy. There were follow-up series in subsequent decades but none duplicated the success of his earlier program. 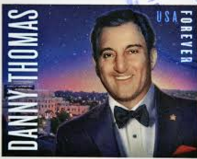 In addition to acting, Danny Thomas was known as a prolific television producer, and he also helped found St. Jude's Children's Research Hospital in Tennessee. He was actively involved with St Jude's for nearly thirty years, until his death in 1991. After his death, he was honored with a postage stamp...and it's easy to say that Danny had put his own special stamp on Hollywood and American culture. Danny Thomas present and accounted for..! 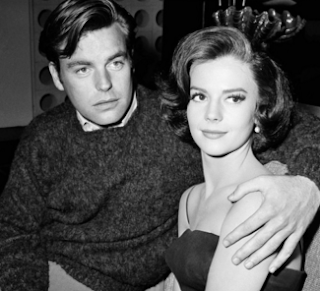 Natalie Wood & Robert Wagner present and accounted for..! 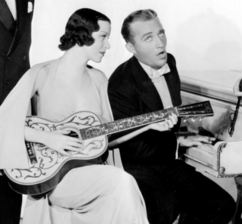 Saturday December 5th: Popular MGM stars who transitioned from silent films to sound, once engaged. 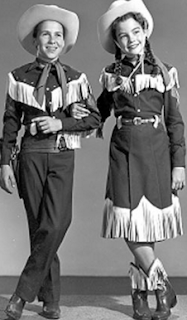 Sunday December 6th: Republic's kiddie western stars of the early 50s. Monday December 7th: A leading man of the 30s who died during WWII. Tuesday December 8th: A starlet who made B films, many for producer Robert Lippert. Wednesday December 9th: A British star who occasionally did a Hollywood film (one with Joan Collins). Friday December 11th: Two African-American stars who made a film with director Otto Preminger. Friday: Harry Belafonte & Dorothy Dandridge? I should know Saturday and Wednesday, but the names won't come to me. You're correct about Friday. But Monday is someone else. That's all I've got without researching, and I don't want to cheat. Going back to Monday for a minute-- I will probably save Leslie Howard for later on. But like him, I wanted to feature a Hollywood star who gave his life in the war, especially as it will be December 7th, Pearl Harbor Day. 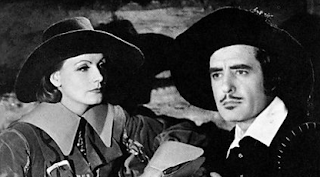 A lot has been written about Greta Garbo over the years, and often the biographies include a great deal of discussion about her frequent costar John Gilbert. Contrary to popular belief, Gilbert did transition to sound and appeared in 11 talkies, though he could not maintain the level of success he had as a leading man during the silent era. One of his films from the early 30s with Garbo was certainly a triumph-- QUEEN CHRISTINA. Altogether MGM's two great stars made five motion pictures together. The first one was FLESH AND THE DEVIL in 1926. At one point, the couple, who were involved off screen, were said to marry. Garbo apparently called the wedding off at the last minute, and in fact, she never did marry. Gilbert went on to mend his broken heart with actress Virginia Bruce, the lovely young costar in one of his last films. Greta Garbo and John Gilbert present and accounted for..! Michael Chapin and Eilene Janssen were known as the Rough Ridin' Kids. 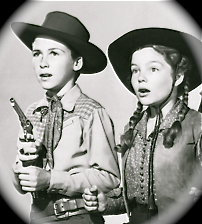 They costarred in four kiddie westerns at Republic Studios in the early 1950s. These films, loaded with action and frontier cliches, did well with matinee audiences. And yes, Chapin often carried a real gun in these films, though he never fired it. The young actor had been on contract at Republic for a few years, with significant roles in earlier westerns like Roy Rogers' UNDER CALIFORNIA STARS. But he and Janssen hit their stride with the Rough Ridin' series. Two of their B westerns are currently available on Amazon Prime: THE DAKOTA KID and WILD HORSE AMBUSH. Michael Chapin and Eilene Janssen present and accounted for..!